Following in the footsteps from last year, the Statistical Society of Australia (SSA) continued rebranding by launching a new website on 4 Dec 2018. I have been actively leading the committee that commissioned and implemented the new website. The website was designed by Converge Design and is hosted using the Wild Apricot association management system. Moving to a new website ended up taking us more than a year. A website is a central point of information and interacts with many other systems. Finding an appropriate platform to use that suited our requirements and budget was a complex task. Our initial motivation was to update the look and feel of the website. In doing so, we also made substantial changes ‘under the hood’. We now have a completely integrated system for managing our membership database, events calendar, email announcements, billing and, of course, our website. This should make many of our administrative tasks much easier going forward. This article was first published in the SSA November 2018 eNews under the title “Well-deserved recognition for Alison Harcourt’s tireless dedication to mathematics and statistics”, written by Damjan Vukcevic & Karen Lamb. In the last newsletter, SSA reported on the ABC 7.30 program which featured SSA member, Alison Harcourt, and her inspirational career in mathematics (see also the accompanying story on ABC Online). We are delighted to hear that since then Alison has been named Victoria’s 2019 Senior Australian of the Year. This award recognises Australians in Victoria aged at least 65 years who are still actively contributing and achieving in their work; this is certainly true of Alison. To this day she continues to train new generations of mathematicians and statisticians and has been a mentor to many great statisticians who have long-since retired! The accolades continued for Alison who was also awarded an honorary Doctor of Science by the University of Melbourne. In addition to her dedication to training and mentoring, these awards recognise Alison’s remarkable achievements. The most visible ones include her seminal paper on the “branch and bound” method, her contributions to quantifying the extent of poverty in Australia and her work that led to the introduction of the “double randomisation” method in allocating positions on ballot papers (still in use today). Given that Alison was working at a time when there was much less support for women, this sort of recognition is well overdue. Finally, we must mention that Alison was the founding secretary of the Victorian Branch of SSA, back in 1964. It is great to see her still attending our branch meetings regularly and supporting the society. The Australian of the Year Awards are awarded to “leading citizens who are role models for us all”. Alison is definitely one of those. Congratulations Alison! Today I gave a short talk about writing R packages at the Research Bazaar 2018 (University of Melbourne). I’ve made my slides available online. The talk is aimed at R beginners. I assume you already know how to write basic functions and want to take the next step and learn to put these together into packages. If you are a more advanced R user, I recommend starting with my much longer talk about R packages that I presented at the Melbourne R user group in 2016. I was reflecting on the important events of the year for me and was surprised to notice that one of them seems to have gone completely undocumented. 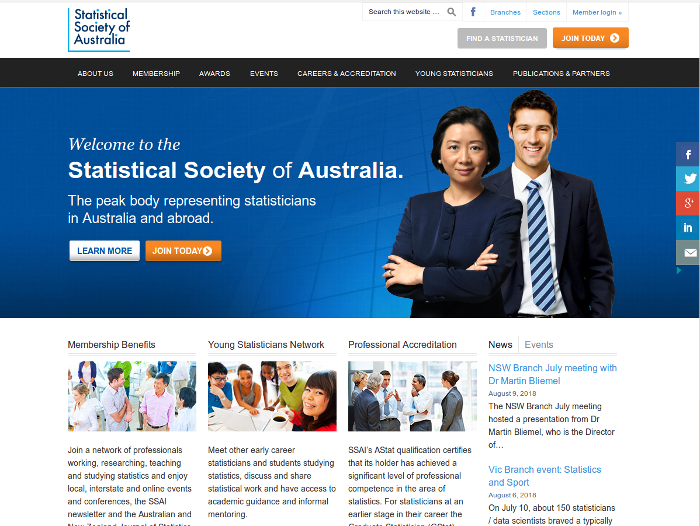 The Statistical Society of Australia (SSA) is going through a long process of rebranding. A key milestone was the adoption of a new visual identity, complete with a fresh, modern logo. We launched this on 18 May 2017. I chaired the committee that commissioned and implemented the new identity. The design was created by A Friend of Mine and implemented by Marina Watson. As well as multiple versions of the logo, the visual identity also includes a customised colour palette and typeface. We have created templates for letterheads, signs, banners and several other items. If you want any of these, or need to create SSA-branded items, please get a in touch with our Executive Officer to get a copy of our ‘brand pack’. The logo is based on a scatter plot, a simple, straightforward and popular data visualisation technique used throughout statistics. The elements of such a plot have been pared back to create a clean, understated look: the unadorned axes frame the text and the dots on the ‘i’s represent data points. The dots are also aligned in the shape of the Southern Cross, a subtle reminder of the fact that our society is Australian. I spoke at the Actuaries Summit yesterday. Together with Jessica Chen, a friend of mine who works as an actuary, we presented a paper that summarised the latest genetics research and what impact it might have on the life insurance industry. Our work generated a lot of interest and was even picked up by the Australian Financial Review! Update (30 Jun 2017): A recording of our talk is now available. Also, yesterday we published an article in Actuaries Digital describing some of the highlights. It is well known that replicating a scientific experiment usually leads to a more conclusive result. One way in which this happens is that the statistical evidence becomes stronger when it is accumulated across many experiments. What is perhaps surprising is that describing and quantifying how this happens is not straightforward. Simple explanations can easily be misinterpreted if they gloss over key details. Suppose we run a single experiment, using the conventional 5% level of statistical significance. A positive finding from this experiment will be wrong 1 out of 20 times. However, if we were to run three experiments instead of just one, the chance that all of them would be wrong would be 1 in 8,000 \((= 20^3)\). The fact that is being explained here is that the false positive rate is decreasing. That is, if we assume the underlying research hypothesis is actually false, the chance that a single experiment will come out positive (i.e. will support the hypothesis based on a statistical test) is 1 in 20, and the chance that all three experiments will do so is 1 in 8,000. However, most people are likely to interpret the statement differently. They will mistakenly think that the chance the research hypothesis is true, given a positive finding, is 1 in 20. The difference is somewhat subtle. The first interpretation refers to the probability of the experimental outcome given an assumption about the truth of the research hypothesis. The second is the reverse, a probability of the hypothesis given an assumption about the outcome. The two can easily be confused, giving rise to what is known as the Prosecutor’s fallacy. Suppose we run a single experiment, using the conventional 5% level of statistical significance. If the research hypothesis is not true, the experiment will give rise to a positive finding by chance 1 in 20 times, while with three independent experiments the chance that all three would be positive goes down to 1 in 8,000. While this is now factually correct, the message has become a bit harder for a lay audience to understand or relate to. They will want to know how replication helps to answer the question of interest. They may even impose their own interpretation of the probabilities despite the careful wording. Prosecutor’s fallacy still lurks in the shadows. The statistical power of the experiment (also known as the sensitivity or the true positive rate). This is the chance that it will give a positive result if the research hypothesis is true. After we conduct the experiment, we can combine the outcome and the above information together using Bayes’ theorem to determine the posterior probability of the hypothesis. This is our ‘updated’ assessment of it being true, in light of the evidence provided by the experiment. It is this quantity that is of most interest to the audience, and how it would differ if replicate experiments are conducted. For example, suppose we wish to run a psychology experiment that is somewhat under-resourced and we have assessed the power to be about 20%. Furthermore, let’s suppose we are testing a speculative hypothesis and rate the chances of it being true at about 1 in 10. A positive finding in this case would upgrade this to about 1 in 3 (a posterior probability of about 33%), which still leaves plenty of room for doubt. If we replicate the experiment two more times, and get positives each time, then the overall posterior probability would be almost 90%. This would certainly look more convincing, although perhaps not completely conclusive. In comparison, suppose we are planning a clinical trial with a power of 80%. We will test a drug for which we already have some evidence of an effect, rating the chances of this being true as 1 in 3. A positive outcome here already entails a posterior probability of almost 90%, while positive outcomes for three independent such trials would raise this to more than 99.9%. Note that in both of these examples I have assumed the experiments would be designed to have a 5% false positive rate, as is commonly done. That means for both examples the false positive rate for three experiments is 1 in 8,000. However, the quantifiable impact on the actual question of interest varies. The above examples show how to explain the impact of replication on the statistical evidence in a way that is more understandable than if only referring to the change in the false positive rate. I recommend using an example along these lines when communicating the benefit of replication. Tailoring the example to the audience’s interests, including using assumptions that are as realistic as possible, would allow them to more easily see the relevance of the message. Even for a fairly general audience, I recommend describing a hypothetical experiment than referring to generic statistical properties. Setting up this type of explanation requires some elaboration of key assumptions, such as power and prior probability, which can take a bit of time. The reward is a meaningful and understandable example. While it might be tempting to resort to the ‘1 in 8,000’ explanation to keep the message brief, I recommend against it because it is likely to cause confusion. If brevity is very important, I recommend steering away from numerical explanations and instead just describing the basic concepts qualitatively. For example, ‘replicating the experiment multiple times is akin to running a single larger experiment, which naturally has greater statistical power’. Last week I gave a talk on how to make R packages (see my previous post). Given the topic, I though it would be quite appropriate to actually make my slides using an R package! After considering the options, I decided on Slidify. This is essentially a nifty wrapper to other libraries and HTML presentation frameworks. Its default framework, io2012, looked great so I stuck with it. Making the slides was quick and easy: I wrote my content in R Markdown and ran slidify() to compile it into a slick web-based slide deck. It was particularly simple to include R code and have it presented with nice syntax highlighting, as well as show the output of R commands (including plots!). You could embed these rules inside your R Markdown code if you like (by wrapping them inside <style>...</style>), but I prefer to add them as a separate file. Slidify makes this straightforward: just create a CSS file inside assets/css with the above rules and it will automatically be included when you compile your slides (in your header make sure you set the mode page property to selfcontained, which is its default value). Last week I gave a talk about writing R packages to the Melbourne R user group. I’ve made my slides available online. You can also download the code from the example package I used. I wanted to show how easy it is to make a basic package, and only a little more effort to add some standard documentation. Modern development tools, in particular the devtools package, have made the whole process efficient and straightforward. If you are used to a workflow where you put shared code in a file such as functions.R that you then source() elsewhere, then this talk is for you. I gave a talk today at the Young Statisticians’ Workshop hosted by the Canberra Branch of the Statistical Society of Australia. Although the event was aimed at those early in their statistical career, I chose a topic that is relevant for all of us: how ‘big data’ and ‘data science’ relate to our profession and how we can equip ourselves to be actively involved. My talk covered some similar ground to a talk I gave last year at the University of Melbourne. That one targeted academic statisticians in particular and discussed how I think statistical education needs to change. In contrast, I aimed today’s talk at students & recent graduates and suggested ideas on how to kick-start a career as statistician and data scientist. See my slides for more details.